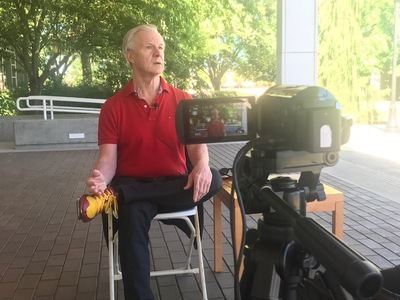 Allen Meadows is photographed during an oral history interview outside the Jereld R. Nicholson Library at Linfield College in McMinnville, Oregon on July 29, 2017. Meadows was interviewed by Linfield College archivist Rich Schmidt. Allen Meadows is the founder of Burghound.com, a website devoted exclusively to Burgundy/Pinot Noir wines, with rotating coverage of Champagnes/Sparklers. In service to the website, Meadows spends more than five months a year in Burgundy visiting, researching, tasting, exploring, and evaluating. Linfield College Archives, "Allen Meadows Interview 05" (2017). Browse All Beyond Oregon Oral History Interview Photos. Image. Submission 22.